People throughout South Asia will soon pause to remember the giant waves that ten years ago this month swept over thousands of coastal communities, killing hundreds of thousands of people and leaving millions homeless. This is the story of several of those communities. Immediately after the December 26, 2004, tsunami, I flew to Sri Lanka to cover the crisis, and I went back to the region several times over the years to report on the recovery process, a complicated drama with many unexpected plot twists. I’ve written before about how the wealthy of Sri Lanka took advantage of the destruction to drive the poor off of beaches in order to hand them over to resort hotels. And I’ve described how the worst hit area, Indonesia’s Aceh province, was in the middle of a separatist war when the waves hit, yet the tragedy triggered a peace process that eventually led to the region’s autonomy (and eventually to a form of Sharia law which is today causing new problems). The outpouring of international aid to the region played a major role in helping people survive, but it also brought its own contradictions. The rush to spend money by some NGOs led to the hurried construction of hundreds of houses that today stand empty, silent monuments to all that’s wrong with the aid business. In short, the tsunami-battered shorelines were fertile ground for lessons to be learned, and in some cases ignored. I recently returned to the Indonesian islands of Sumatra and Nias to see how people were getting along. I wrote ten reports for the ACT Alliance about communities where its member agencies had worked. Here’s a sample of those reports, adapted a bit for my blog. They are communities whose experiences reflect some of the challenges, accomplishments, and lessons of this past decade. When the earth shook in 2004 under the seaside village of Kuala Bubon, Husna was washing clothes at a well. She ran to find her mother, but the older woman refused to leave their house near the sea. So Husna ran with her 8-year old son Bagus to the mosque, where some villagers were hurriedly preparing to leave. She left Bagus there and returned for her mother, who again refused to leave, even though the sea level was dropping drastically–a prelude to a tsunami, though Husna admits she’d never heard the word before. Husna hurried back to the mosque, where police trucks were loading people to take to higher ground. She was assured that her son had been placed on a truck that left. So she went back for her mother, as the water now rose around their house. Her mother stubbornly said she’d climb on a bed and be ok. Husna finally left her and waded through the swirling water to escape on a fleeing vehicle. She never saw her son or her mother again. Both apparently perished in the chaos. “There were dead bodies everywhere, and we searched for days and days but never found them,” Husna said. 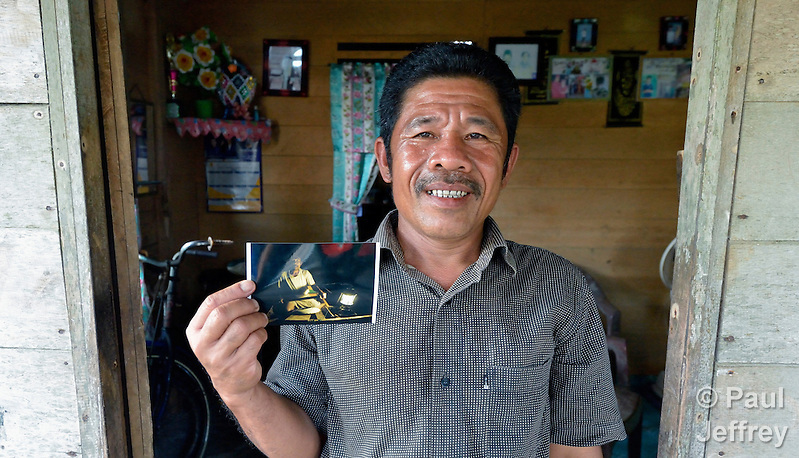 Her husband Ramli had been at sea when the tsunami struck. His small fishing boat capsized, and Ramli tied himself to the craft, reasoning that at least people would find his body afterward. Yet he managed to survive, and soon joined in patrolling the waters off the coast to recover the bodies of his neighbors. In all, 55 people died in Husna’s and Ramli’s families–a small fraction of the more than 200,000 people who lost their lives throughout Indonesia’s Aceh province. In the weeks after the tsunami, Husna and Ramli lived in a tent before crowding with other survivors into hastily constructed wooden barracks. As the months went by, they learned the government planned to relocate their village four kilometers inland, far from the sea, as part of its policy to prohibit construction close to the water’s edge. Husna opposed the idea. “I lost most of my family there. At least I can go on living close to them,” she said. The government chose a Catholic NGO from the United States to build homes at the new site, but Husna and a growing number of her neighbors refused to accept the relocation. She was elected to a five-member committee to negotiate with the government. She says the community was divided. While most of the fishing families wanted to remain near the sea, those who worked as teachers or had other government jobs favored accepting the relocation proposal. Several families accepted relocation and left, but Husna and most of the village remained, committed to staying near the coast but unsure of how they would rebuild. In 2008 the community finally moved into their new homes, but quickly had to face a new challenge. A massive U.S. government-funded project to build a new road from Meulaboh to Banda Aceh was taking shape, and engineers arrived to announce that 20 of the community’s new homes would have to be demolished to make way for a bridge to replace the ferry that had crossed an estuary nearby. Once again, the resident of Kuala Bubon didn’t accept what others defined as their fate. Husna and others met with government officials and human rights groups to complain. The road builders launched a counterattack. Husna says one official from the U.S. Agency for International Development came to the village to threaten them. “He said if we blocked the road from being built here they would move the route far away and we’d be shut off from any economic development,” she said. Undeterred, they continued resisting and engineers finally shifted the route a hundred meters to one side, leaving the community unaffected. Life in the valiant community goes on. It’s now seen by many as a model for the post-tsunami reconstruction mantra of “build back better,” and Husna said if anyone moves away there is a constant demand from new families to move in. Husna’s husband has returned to the sea, but fish stocks have declined in recent years, she says. With aid from YEU, Husna helped start a women’s savings group, and she has used loans from the group to expand a small store she operates out of her house. Just as they fought for their rights, today they’re fighting to survive and raise their families. Ferianus Laia was born shortly after a tsunami and earthquake combined to level the village of Tugala on Indonesia’s Nias Island in late 2004 and early 2005. So he lived his first three years of life in a tent before his family moved into a new house built by Church World Service, a member of the ACT Alliance. That strong concrete house replaced the rickety old one that weathered the tsunami but finally collapsed during the quake. Or so he’s been told. Ferianus doesn’t remember any of that. Now 9 years old, he just knows that he has a place to sleep where the roof doesn’t leak. And there’s a toilet to use, and clean water that comes out of a pipe. Other than that, he doesn’t worry about much. He goes to third grade in the mornings and plays football with his friends in the afternoon. He’d like to be a teacher. Or a football star. He can’t decide. The normalcy of Ferianus’ days is a testament to the partnership that CWS established with the village following the quake. Along with other members of the ACT Alliance, CWS helped the community get back on its feet. Practicing the “build back better” mantra of the wider response to the tsunami and quake meant using the moment not just to rebuild assets and capacities directly affected by the disaster, but also to address larger political and developmental challenges that had lingered for years. In Tugala, that meant the Yakkum Emergency Unit–another ACT Alliance member agency–built a health post while CWS established a program for identifying and feeding malnourished children. It meant finding a source for clean, safe water and piping it into the village. It meant training midwives, starting a livelihood program, and providing psycho-social services to individuals who remained traumatized even though they had survived the quake. It meant providing games and play spaces for children crowded into leaky tents. It meant working with government agencies and other NGOs to assure long-term sustainability. It worked. Today, the clinic still operates, midwives deliver babies, the school bell rings, the clean water flows, and Ferianus lives the life of a normal child. That doesn’t mean it’s been easy. Ferianus’ parents work hard. His father, Atonira Laia, cultivates rice in a nearby paddy, but works in construction when he can get a job. He earns just enough to feed the family. Ferianus was his parents’ first child, and they’ve since had two more. Besides caring for his younger siblings, Ferianus’ mother, Damaria Halawa, searches the nearby forest for leaves to feed their pigs, and she dries a modest harvest of cloves and cacao in the sun in front of their home. She prepares a simple meal for her family in a kitchen that they added on to the house that ACT built. As Ferianus runs off with a football, she tells him not to be late for supper. Nurul Aina was not at home when the 2004 tsunami swept over Lam Pulo, a neighborhood of Banda Aceh on the northern tip of Indonesia’s Sumatra Island. The 8-year old girl was sleeping at her grandparent’s home several kilometers away, and was thus spared the violent waves that flattened the family’s home, killing her parents and two siblings. As international aid poured into Aceh in the months after the tragedy, the residents of Lam Pulo grew frustrated with the slow pace of reconstruction. Promises of new houses from a giant NGO assigned by the government to the neighborhood were slow to materialize. Finally Diakonie Katastrophenhilfe, a member of the ACT Alliance, came to the neighborhood’s rescue. Working with the Katahati Institute, a local advocate of grassroots democracy, residents agreed with Diakonie Katastrophenhilfe on a plan to build 70 new houses. 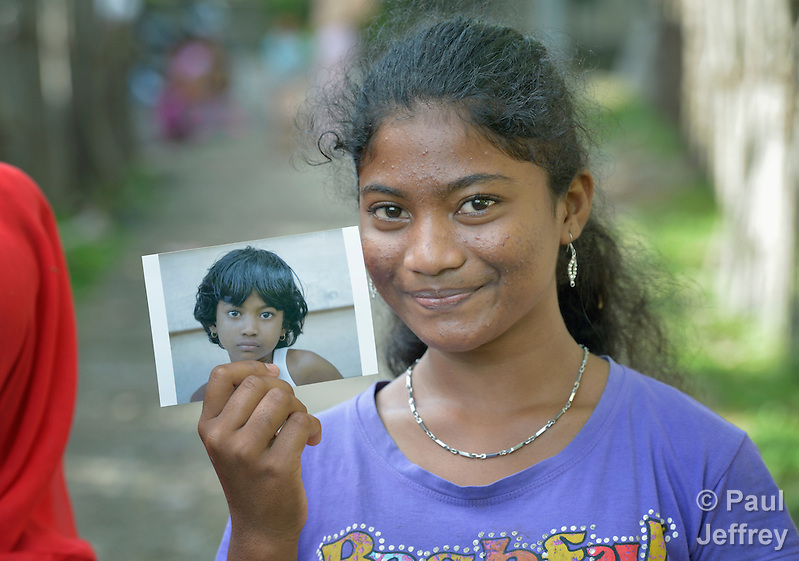 Yet what would happen with Aina and three other orphans in the neighborhood who had lost their families to the tsunami? 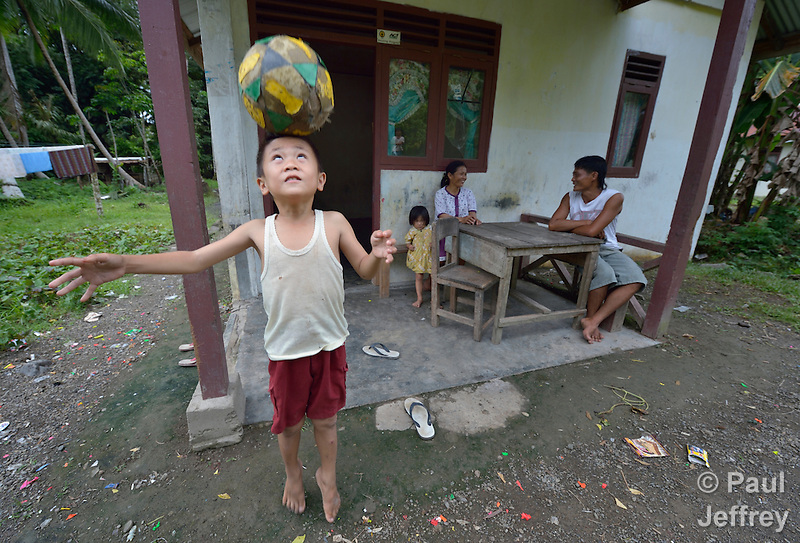 Under Indonesian law, children cannot own property until they turn 17. 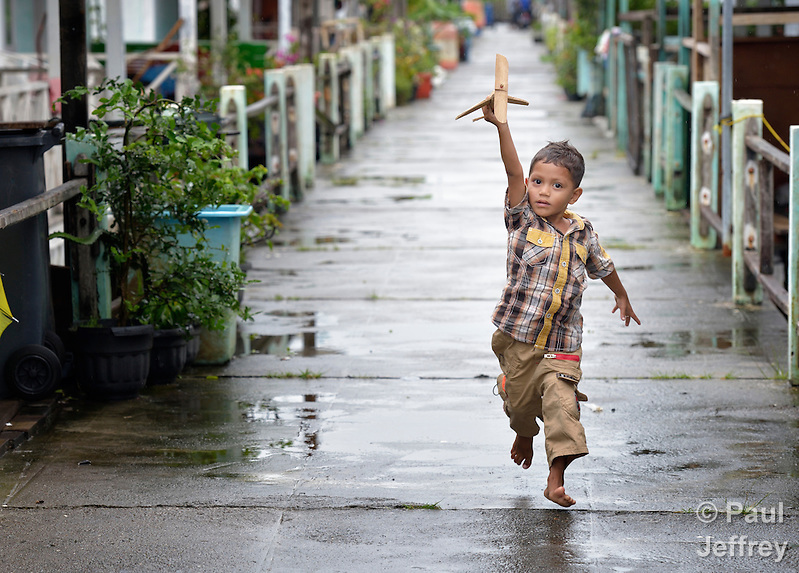 Under local Acehnese law, however, Aina and the other orphans could receive title to a new home. Katahati spent months arguing the children’s case before local authorities. “We could easily have had the title issued in the name of an older relative, but we wanted to avoid any problems in the future if that relative decided to keep the house for their own children,” said Raihal Fajri, Katahati’s executive director. It took over three months to secure permission to issue the title in the children’s names, but Fajri says it was worth the effort. “Today there are children coming of age in other neighborhoods who are being denied possession of a house which is rightfully theirs, and people have asked us to intervene with the government on their behalf. But it’s too late now. The lesson for us is to make sure to advocate for the children’s rights at the very beginning,” she said. According to Fajri, while Aina’s age was a challenge, her gender wasn’t an issue when it came to issuing the title. Yet not everyone who came to Aceh after the tsunami understood that principle. “The United Nations Development Program wanted to issue land titles only in the husbands’ names, and we had to push to get them to recognize local customs and issue the titles in the women’s names. If there is other property, such as agricultural land, that is usually registered in the name of the man. But the house should be in the woman’s name,” Fajri said. 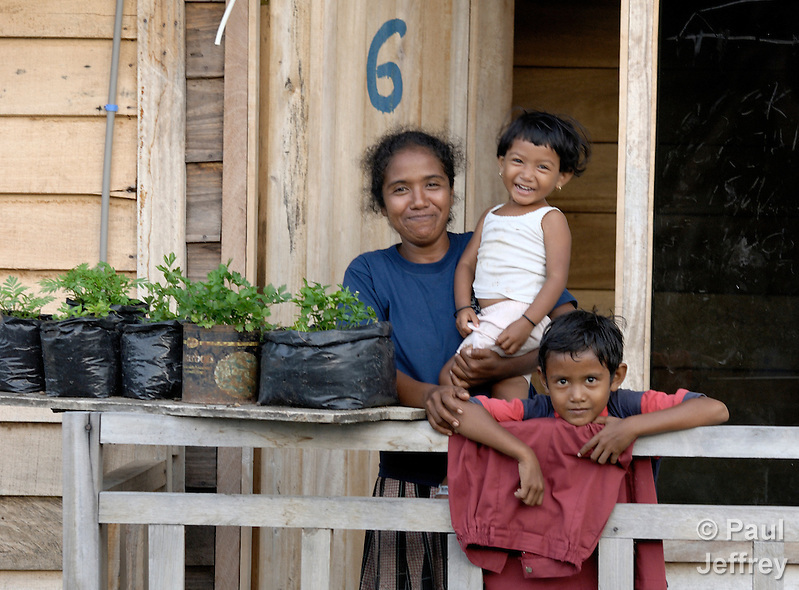 When construction of the new houses in Lam Pulo was finished, Aina continued living with her grandmother, and her house was rented to another family. The rental income assured that Aina remained in school, and eased the financial burden on her grandmother. Aina says she only recently learned from Fajri that the house was in her name. She says she’d like to move into her house someday, perhaps when she marries and starts a family. In the meantime, Aina, now 18, has begun studying English at a local university. She is enthralled with the language, which she says is the key to international communication. She says she’d like to become a university lecturer someday. You’ll notice that Rusmiati has had one more child in the interim. Vera is now 5 years old. 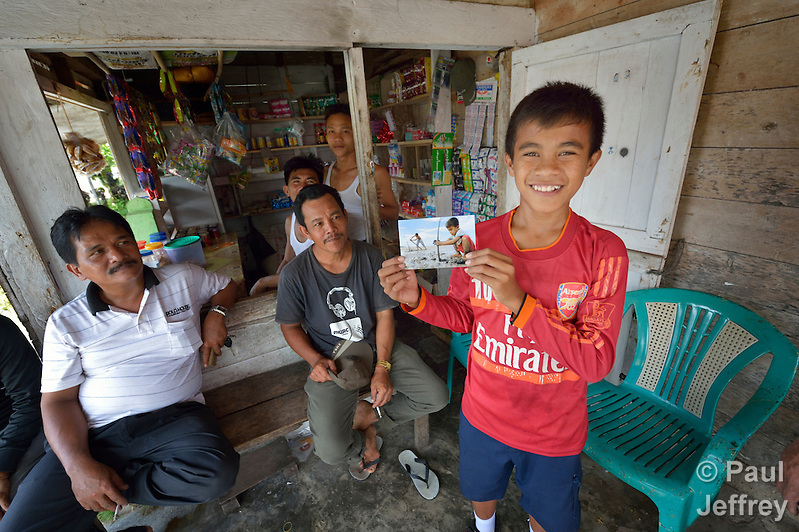 Fathan, who was 24 days old when the tsunami hit, is now 10. And her son Rahmat is 15. When the tsunami hit in 2004, the family lived in a simple thatched roof house near the beach. Rusmiati grabbed the infant Fathan and headed for the hills. For the next two years, the family lived in a tent perched on the hillside. With her husband Afan, Rusmiati had moved to Lhok Me to farm chilies and vegetables on the low-lying fertile ground, but after the tsunami swept away everything they decided they’d had enough of living at the edge of the ocean. So with 25 of their neighbors, they decided to build a new village far out of reach of the towering waves. Their temporary tent site became their new village. YEU built them new houses and helped a group of village farmers get their fields producing once again. The farmers were all men, however, and Rusmiati said the women of the community also wanted in on the action. They convinced YEU to help them develop a plan to take advantage of the tourists who were traveling from the nearby capital city of Banda Aceh to enjoy the scenic beach at Lhok Me. For years, village women had been selling soft drinks and coconuts to the visitors, but their simple wooden stands were destroyed by the waves. So YEU built five gazebos along the beach that the women could share. Shortly after the gazebos were constructed in 2008, however, four of them were deliberately burned to the ground. Rusmiati says it happened in the middle of the night with no witnesses. Yet she suspects people from a neighboring village lit the matches. She’s not sure why, but says the other villagers were either jealous of the women’s progress, or, more likely, were concerned that growing tourism at the beach was providing an occasion for what they considered immodest behavior. While her son, 15-year old Rahmat, has dropped out of school, Rusmiati says she hopes her daughters will get an education, even go to university. “It all depends on money, however. The income from selling things on the beach all goes into buying food for the family and restocking my little business,” she said. Public school is free through 6th grade, and beyond that Rusmiati will have to pay for her daughters to continue to attend class. She doesn’t know how much it will cost. She hasn’t even asked. When a devastating earthquake struck the Indonesian islands of Sumatra and Nias in early 2005, more than 1300 people were killed, most of them on Nias. Yet hundreds of those who survived were seriously injured and over the following months had to learn to live with disabilities. An Indonesian organization played a key role in helping them move forward, while at the same time assisting others whose disabilities predated the earthquake. Misbah Teleumbanua wasn’t injured in the quake. She had lost most of her right leg shortly after birth, and had never been properly fitted with either a prosthesis or crutches. So she had always hopped around her Nias island village of Gamo on one leg. In the days immediately following the earthquake, she met a team from the Yakkum Emergency Unit, an Indonesian member of the ACT Alliance that ran a rehabilitation center in far-off Yogyakarta. “They were going house to house looking for people who’d been disabled by the quake. They said they could help me, and it didn’t matter that I’d lived with my disability for a long time,” said Teleumbanua, who was 34 in 2005. Soon she was getting fitted for a prosthesis and learning how to move around. 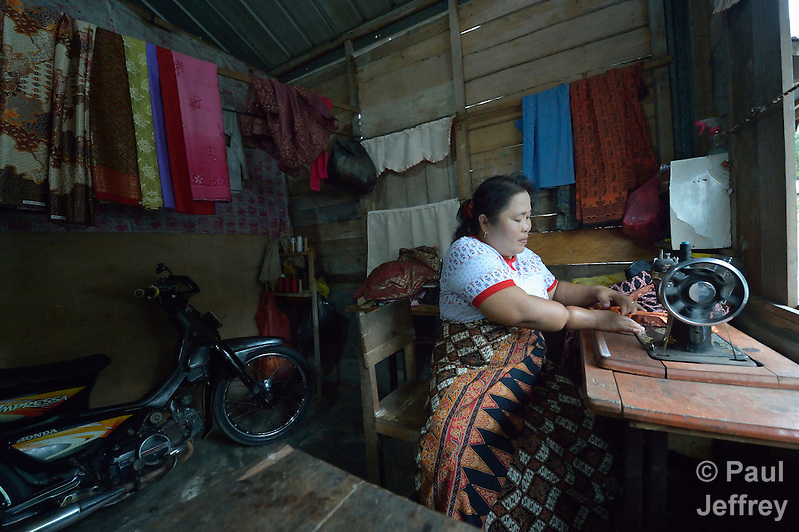 Teleumbanua spent three months in a YEU tailoring class, then opened a business sewing clothes for her neighbors. Within a year, she said, she could walk as far as she wanted with no difficulty. Because of its experience working with people with disabilities in Yogyakarta, YEU had been able to quickly ramp up its services on Nias. It rented a house, then quickly was forced to rent an even larger facility as the number of people with disabilities, particularly paraplegics, was more than expected. It provided medical care and physical therapy, as well as psycho-social attention. It supported the creation of eight disabled people’s organizations, encouraging those living with disabilities to provide mutual support and advocate for their own needs. It also provided livelihood training, including pig-raising, electronics repair and tailoring. By 2007, emergency funding was running out and YEU was contemplating closing the program. Yet demand for services remained high, so YEU appealed to the ACT Alliance, which provided funds to continue operations until 2010. The program bought land and built a specialized clinic, yet never reached the point of becoming self-sustaining. By 2011, in search of financial independence, the center started offering general medical care in Gunungsitoli. The following year it became a small hospital. YEU continued to cover the deficit. In 2014, the expansion of a government health insurance program to include private citizens provided the facility with new viability. On November 1, it began accepting patients under the government program, guaranteeing the income to survive. According to Fonali Lahagu, a physician who came from Yogyakarta to supervise the clinic’s evolution, the facility and its staff are well known on the island and respected for the quality of their services to quake victims. “People see us as part of the Nias family,” he said. Lahagu said that without assistance from the ACT Alliance, the clinic would have closed long ago. 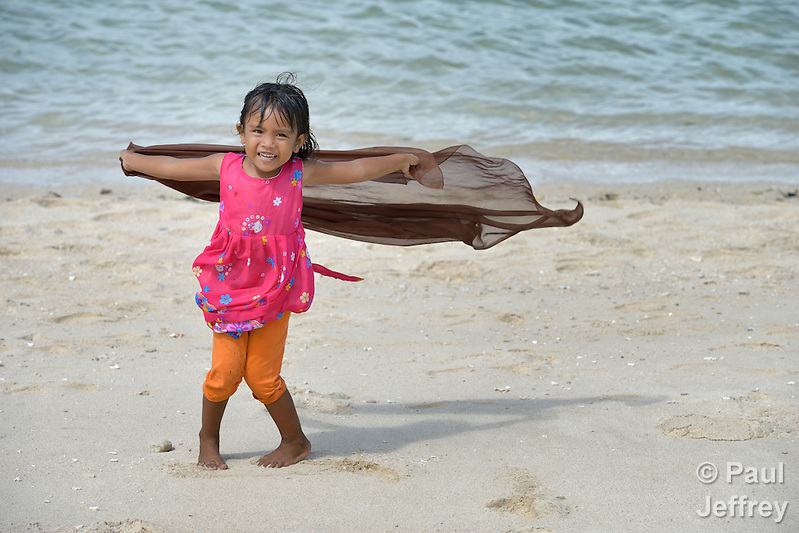 “We are one of the few NGOs that stayed here on Nias. Most groups came in for a brief period after the earthquake and then left. YEU and the ACT Alliance stayed, though we’ve had to struggle to find a way to make that presence self-sustaining,” he said. When the giant waves hit Moawo, a small village on the coast of Nias, a remote Indonesian island in the Indian Ocean off the west coast of Sumatra, there was little to hinder their advance, so the wooden houses in the small fishing settlement quickly succumbed to the tsunami’s ravages. Alerted by the preceding earthquake, most of the villagers were able to run to nearby hills in time. Only one villager died. As the waters receded, the survivors faced the enormous task of rebuilding their homes and livelihood. YEU accompanied the villagers during the difficult months that followed. 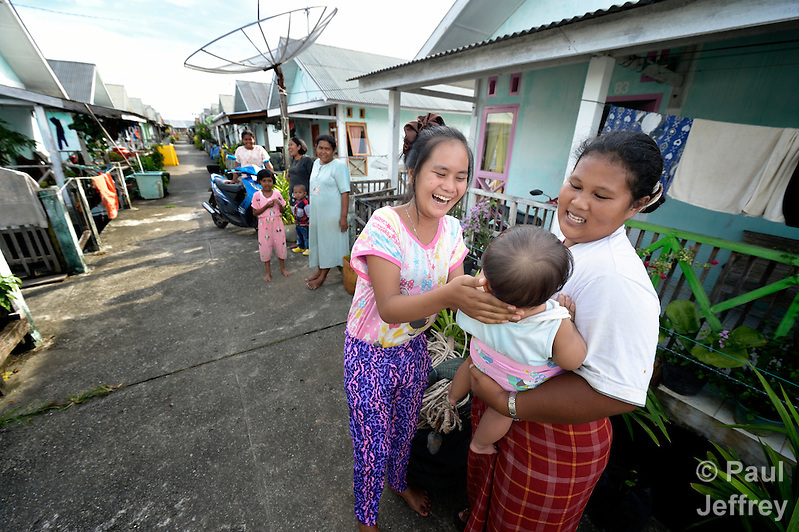 With help from the rest of the ACT Alliance, YEU built 72 houses with cement foundations, replacing the rickety wooden structures that had easily crumbled under the tsunami’s onslaught. YEU and the villagers built a new street and collaborated on income generation projects to kick start the local economy. 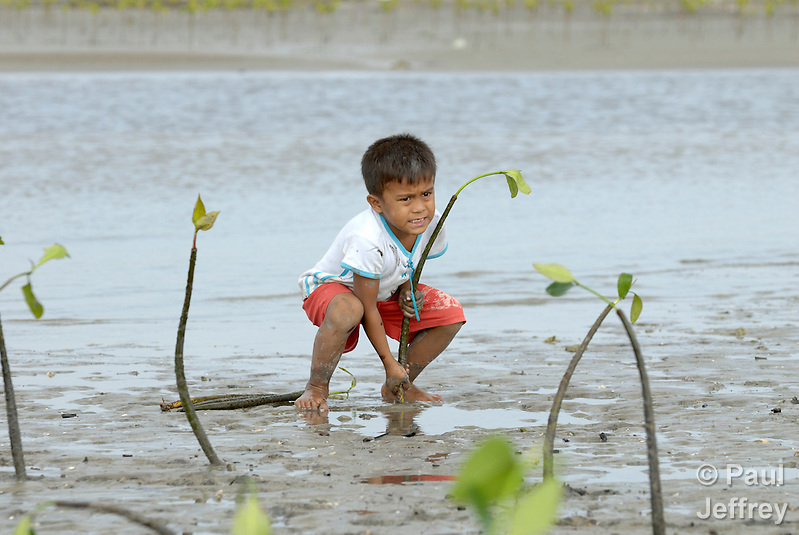 With YEU’s help, they also planted mangrove seedlings along the bare coastline. Today, ten years after the tsunami, those mangroves have matured, flourishing into a robust barrier against the sea’s excesses. “The mangroves have worked as a breakwater, slowing down the big waves and stopping erosion,” villager Idris Zendrato told me. Here’s a photo I took in 2007 of Zendrato’s son Jefrin planting mangroves, and then one from this trip of Jefrin, now 13, standing in the same place. As you can see, Jefrin has grown quite a bit. So have the mangroves. According to the International Union for Conservation of Nature, the 2004 tsunami provided several examples of villages that were saved because of the protection provided by thick mangrove forests. Throughout the region, however, mangroves have suffered from the expansion of shrimp farms and tourism projects, leading environmentalists and disaster risk reduction specialists to argue for their replacement. 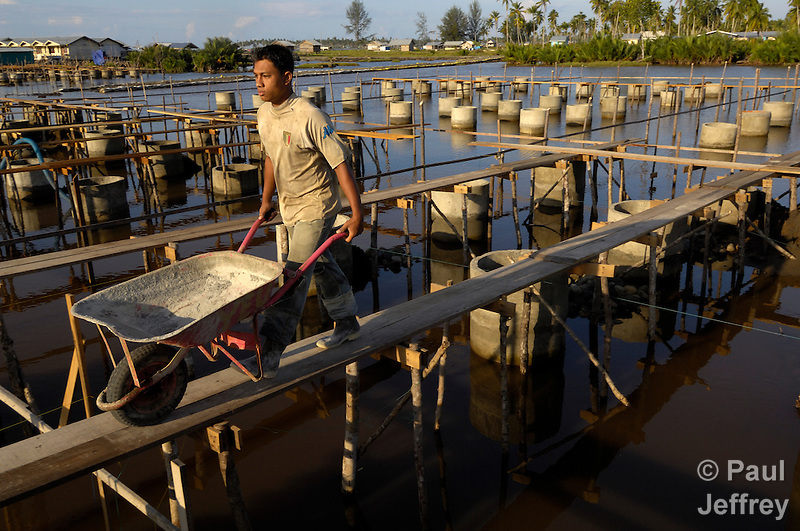 Mangroves also provide a fertile breeding ground for fish and other sea life, helping to revitalize local fishing industries, helping both income and nutrition among villagers. That’s the case in Moawo. “The mangroves have attracted little crabs and little fish, which bring in the big fish. That makes it easier to earn a living as a fisherman,” said Zendrato. He also said the mangroves help counteract a changing climate. “Years ago, before the tsunami, we’d have a tidal surge on the sea about once a month, but now that’s happening four or five times a month. The wind is getting stronger, and the current along the coastline is increasing,” he said. Zendrato’s son Jefrin helped him plant the mangrove seedlings that have today become a marine forest, though Jefrin told me he doesn’t remember planting them. He says he doesn’t remember the tsunami, either. Older people in the community have told him all about it. A 7th grader today, he says he wants to be a policeman when he grows up. “They get a lot of exercise so they always look strong,” he said. Nurul Huda’s father was a fisherman, and the 46-year old resident of Olora, a village on the Indonesian island of Nias, has been a fisherman all his life. But it’s getting more difficult to make a living from the sea. Huda doubts his son will follow his footsteps to the sea. Olora was one of many seaside Nias villages that escaped the worst of the December 2004 tsunami because of its relatively shielded location along the Mentawai Straits. It wasn’t so lucky in March 2005, however, when a quake measuring 8.6 on the Richter Scale shook Nias and parts of nearby Sumatra, killing some 1300 people, most of them on Nias. Huda’s home was destroyed and his boat damaged by the quake, yet soon Church World Service started working with a cooperative of Olora fishermen, providing them with new nets and boats in order to jump start the village economy by getting them back to sea as quickly as possible. The boats were built locally, and soon Huda and his colleagues were bringing home the catch. They used the proceeds to repair their homes and rebuild their lives. 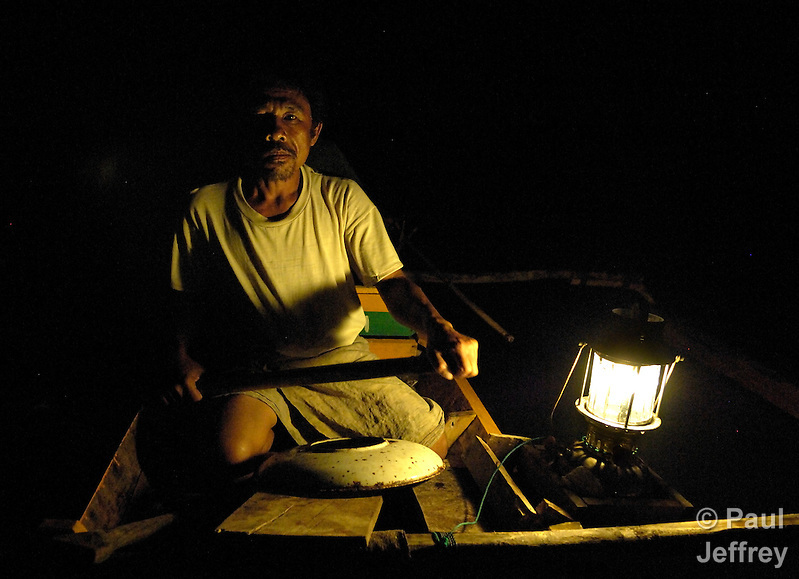 The photo above is one I captured in 2007 when Huda, in his CWS boat, took me fishing with him at night. In the decade since the quake, however, it’s been hard to maintain the same enthusiasm about fishing. As fish prices eroded, costs for gasoline for their boat motors went up. Given the daily use of a boat in the salt water and tropical sun, boats have to be replaced every two or three years. Before long, the cooperative dissolved as one member after another gave up on fishing. 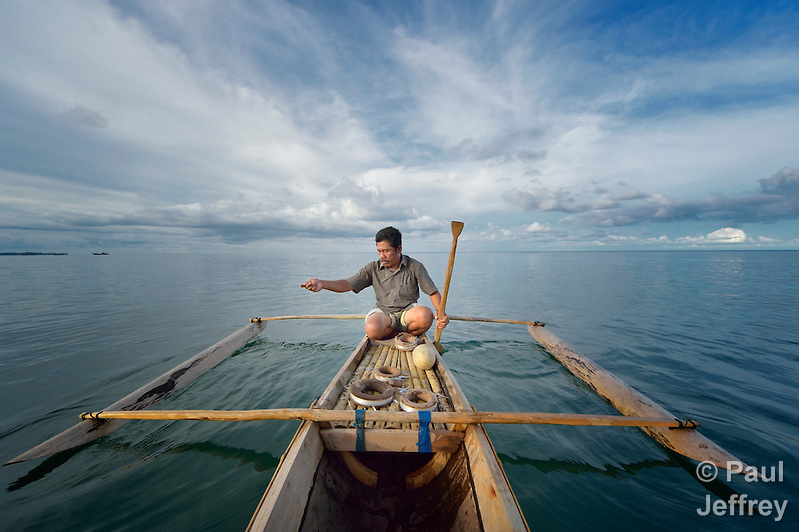 Huda has persevered, though he can no longer afford a boat motor, so he uses a smaller boat he paddles from shore. That puts him at a disadvantage. “The big fish are all out farther, but to catch them I’d need a motor to get there. I can’t go that far, so I catch fewer and smaller fish,” he said. Here he is fishing in 2014. Climate change has also had a negative impact on his livelihood. Huda goes to sea every morning about 4 am, returning with his catch about 10 am. He sells the fish along the highway that runs along the coast, but he complains that fish from other areas, even from Sumatra, are now brought to Olora to be sold, driving down the price he receives. He used to go out again in the evening, but says he seldom does that now. “That’s when the younger ones go out again,” he said. Huda has a 16-year old son, and although fishing has long been a family tradition, he wouldn’t mind if his son found more stable work. In Olora most young men still take up fishing, Huda says, but in nearby Gunungsitoli most young men are turning to construction work and mechanics’ jobs to earn a living. Huda doesn’t know how long people in Olora will continue to look to the sea for their livelihood. A few of the communities I visited on this assignment were places I visited in 2007. So I took some prints along in case I ran into some of the same people. December 2, 2014 | Filed under Asia, Blog, Disasters, Environment, Photography, Uncategorized.